Dear Sheree, You were kind enough to answer my questions about healthy fats as I need to gain weight from not eating while at the same time follow the diet plan. You were very encouraging and gave me some very helpful information on gluten free fats. I am such a mess, I wrote it down, however can't find what I did with it. I had asked you about peanut butter and you said that was fine. You included some other good gluten free fats in your answer. I have looked for the page (in the forum) in which I had written and you had answered but it seems to be gone. I am really struggling to eat, and keep my anxiety under control but am not doing so well with it. My extreme hair shedding which has been going on for 11 months has seemed to have gotten worse. I don't know if the anxiety and not eating is keeping it going or what it is. I am sorry I am all over the place in writing. I feel very hopeless and am not functioning well. I am trying so hard to just feed my body correctly yet most days I have no appetite. 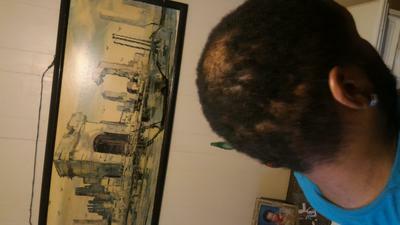 Before this shedding (hair loss) started I had no issues with hair fall and a full head of healthy hair. I had lost a lot of weight two months prior to this starting. I was so anxious I couldn't eat. I also had an allergic reaction to a medication and two days later is when this started. I was told it would stop within three to six months. It has been 11 and the anxiety is worse, the shedding is out of control. I guess I just need hope this will work for me too. If I can eat right and stop stressing. My hair loss didn't really hit the top of my head until the last couple months now it has a lot. Its now all over and I can see my scalp, all my parts are bigger, where before it was mostly just in the back and sides. I am sorry this is so long. Thank you for all you do, and for starting this hair loss diet. I much appreciate all you do for others. I am not functioning and should mention before this even started I suffered from a body image disorder. This is truly making me suicidal and I want to cope better and feel more positive. I can't stand to look at my head anymore or myself. I was handling it better up until the last couple months. I think the fact that it has gotten worse instead of better has kicked off more anxiety. I'm unsure if the stress caused the hair loss or your diet. One thing is for certain: There are very powerful hormones that shoot into your system when you're under severe stress. So if you're doing the diet perfectly, you can still shed. The shedding pattern related to stress is different for each person. within one to two weeks, the hair loss anxiety left me and never returned. If you're feeling like ending it all, you have to employ the use of either therapy or hypnosis to calm your anxiety. I would be devastated if you did anything to yourself. Hair loss is totally reversible. I work with people every day who are experiencing hair loss. The people who get the fastest results are the people that keep their eyes up towards the sun and never look down. There was movie called The Witches of Eastwick. In this movie, they were floating high above the ground. And when they were about to fall, they laughed, and their laughter made them float back up towards the ceiling. So in other words, their laughter saved their life. That's what you have to do right now. Laugh and smile. Your body will emit chemicals that will make you feel better. Find a way to float over the pain, and don't immerse yourself in it. When you focus on the pain, it multiplies ten-fold. In your situation, control the stress first, and then attack the diet second. They really do work together. I have 100 percent faith that your hair will grow back, because I've seen it over and over and over again. And it will happen for you too. Thank you Sheree, I am trying very hard to control the anxiety but honestly I feel I am in fight or flight mode all day every day. I had anxiety before this started and this has caused that anxiety to skyrocket. I am in therapy but may try the tapes suggested on here. I am really trying to just eat period. If I let myself I could go a week without eating anything. I thank you for giving me hope and support. I really appreciate it a lot. I am shedding worse than ever and my once nice hair is now awful. It is affecting the top of my head now and this scares me. I have horrible anxiety and haven't been able to eat well for more than a couple of days. Constantly nausea. I am very scared and think about my hair 24 hours a day. I don't leave the house anymore. I already had a severe body image disorder and the only thing I really liked about myself was my hair. I am scared to use rogaine because I am already shedding so much hair I can't afford to lose anymore. I need to gain a lot of weight, lost due to anxiety and stomach problems. If anyone has any ideas of things that are easy on the stomach and also in the diet I would appreciate it. Also anything that is non chemical that I can apply to my scalp that would help. This has been going on for over a year and falling out in clumps out of the blue it started. I have never had any hair problems before and this is really killing me. It wasn't noticeable for a long time, now I am very self-conscious and the health of my hair is not good either. I can't believe I have any hair left the way I am shedding. Originally was told it was from losing too much weight. It seemed it was starting to slow down p in the winter and was having new growth. Now it has started to increase to a point I can't keep up with it. I have heard about garlic and onions on scalp but afraid it will aggravate my sore head. Everyone is telling me stress and not eating is causing this to continue I don't know anymore. Since I am having trouble consuming enough calories and my anxiety is out of control, I was wondering if you think I would benefit more if I signed up for coaching. I just need to set up a paypal. My question is since I have stomach issues, and sometimes can't eat a thing all day could you in coaching set up a menu for me that would address all of these things? I also have had high white blood cells for the past year and have a feeling I am not absorbing nutrients. I was prescribed something for laryngopharyngeal reflux. I have not taken it as it makes me feel sicker. Have you ever heard of this and could this along with stress and not eating be the cause of my shedding not stopping? I am going to also download the hypnosis for anxiety. I feel desperate. Any help you can give me I would appreciate. Thank you for your website and support. I'm getting the feeling that your anxiety is the reason for the lack of appetite. Some people eat compulsively when they're under stress, and other personality types will not eat under stress. Some people do both. The reverse balding hypnosis takes care of hair loss in three ways. It gives you the firm conviction that your hair is growing back, which is essential for recovery, and it goes deep into the subconscious mind to get to the root of stress. It also works from the perspective of the law of attraction. From your description of your stress, hypnosis is not only a must, it's an emergency. What worries me is you say you're not eating. This will cause more problems with your hair. You have to eat. I can make you a meal plan, give you wonderful tips, and walk you through every aspect of the diet. But if you're not eating, it's not going to work. You need three meals a day for this diet to work. If you sign up for coaching, I need a commitment from you that you will eat. If you're not absorbing nutrients, that's something else entirely. If there is bowel trouble, it can take months to heal. Sometimes the hair comes back while it's healing, and sometimes it grows back afterwards. Either way, you're going to get better. This has to be done with food. Food is life. Whenever you're ready, go ahead and sign up through the coaching page, and we're going to get to the bottom of this. Thank you Sheree for your support and help. You are correct about the anxiety and not eating. I had a question hopefully you can answer. I have to be put on an eating plan to gain weight and be treated for my anxiety. The program is three meals a day and a snack whether it is inpatient or outpatient. I know some of the food is healthy but it doesn't follow the plan. Is gaining weight and stemming my anxiety more important at this point? Also it was suggested by a trichologist that I take a vitamin that contains DHT blockers and saw palmetto along with minerals to help with healing my body. I know you say women should not take saw palmetto. Would this hurt me? I am desperate to grow back my hair and stop shedding. I will have to deviate from the diet. She suggested I do alkalizing and mineral and DHT blockers until I can eat the way I should for my hair. Thank you for any help you can give me. It's critical to follow your doctor's advice right now. I believe that taking the steps your doctors provide is by far the safest way to handle your situation. We always talk about emotional stress and hair loss. The anxiety and stress have to be under control first. Your doctors will give you the safest, most effective therapy possible. When your treatment is complete, with your doctors' blessings, you can start the hair loss diet. You can always come back to the hair loss diet. It will not have any adverse effects if you wait. Saw palmetto is generally used for men, but I've had women that actually took it. It was recommended by their naturopath, and they did great on it. However, I've read research that shows that saw palmetto is dangerous for pregnant or nursing women. Keep your head up, and never quit. This is not easy. Let's take this one step at a time. I want you healthy! I want to thank you for your caring response. You are an amazing person and you always make me feel like there is hope. My dermatologist said the same thing gaining weight and getting healthy mentally, lowering my anxiety is what will help with my hair. I hope it will. I also contacted a trichologist (I am so desperate) just to ask some questions. Although my hair shedding is all over my head in the last few months, I notice it at the top too now. I had asked her if there were any natural things I could do to grow back my hair since she's trying to do natural methods, and I can't follow the diet right now. She has some natural topicals for hair shedding since a lot of my hair lost is all over and a chemical won't help that. She does have a completely natural product for that. Along with that she recommends ph balancing the body and minerals. She also mentioned if I was concerned about the loss at the top as well, I could try the saw palmetto vitamin she gives to patients. She said it can be used with an aloe based minoxidil (3x a week) she said not to use the minoxidil any more than that. I will not be able to use anything if I go the inpatient route anyway. I am not sure yet if I am going that way or not. I appreciate your support and all you do. I have tears in my eyes as I can feel how much you care about everyone here and the support and time you put into helping. I trust your advice, so I just want to make sure the saw palmetto vitamins she has won't mess with my hormones. I know you have a lot of knowledge about these things. I will not be getting pregnant or nursing. I hope to get healthy enough to start back up on the diet, follow it fully, and along with addressing my other health issues, grow back my hair. Do you recommend minoxodil used the way she said? Or at all? She said I would not have to use it forever. Her approach she said is to heal the whole body along with some topical treatments (mostly natural) She said used with treating the body and healing it, from the inside it wouldn't be a forever thing. I know it isn't the answer in the long run, proper diet and low stress is. Thank you again and I am sorry for all the questions. Again thank you for all you do, for your kind support and for giving your time and help. I really can't tell you how much I appreciate it. Once I gain some weight and can eat again correctly, I will probably sign up for coaching so you can help me plan out my meals to get me started. Sorry for the long and anxious message. Your doctor sounds like a very caring and knowledgeable person. It's absolutely best to follow your doctor's advice. I think it's interesting that your doctor is combining the Minoxidil with an aloe base and only using it three times a week. Maybe the way she's using it will have a gentler effect, because it sounds like it's diluted. It sounds like she's got you covered. I've had quite a few women ask about saw palmetto. Saw palmetto does not appear to adversely affect the hormones in non lactating or pregnant women. Saw Palmetto is a very effective DHT blocker in both men and women. There are hundreds of people who've adopted the hair loss diet and been very successful. Some people have have extensive hair loss for decades, and were able to reverse it. I've seen serious disorders, depression, and many other serious issues resolve with this diet. Hang on to that ideal until you're done with your doctors' program. when you come back for the hair loss diet, you're going to be in a much better position to handle the rigors of the diet. When you get done with your doctors, and you've gained a sufficient amount of weight, you can work on having a full head of hair. Not only will you have a full head of hair, it could very well grow back thicker than before. So be strong, and find that part of yourself that won't let you quit. Take a step forward, and then hold fast. Take inches if you have to. But just hold on tight. The sun will shine for you again. Hair loss is a massive struggle, and you will gain spiritual insights into your character. This is a painstaking process that takes time to conquer. We're here for you. We're not going anywhere. Please write us about your new program. I believe that your situation could very well help someone else. Never, ever forget how powerful you are. I am so desperate right now. 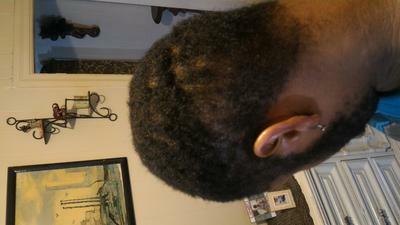 I got a lot of hair cut off in November and my shedding slowed down. I actually could wear my hair down. It was the back was the thinnest part of my hair, but I was freaking out about the top as well because I had thick hair my whole life. I started eating again, it was a miracle and I started to use the products from an online trichologist. My hair was doing well before using the products and when I first started them they seemed to help with the shedding. I got my hair colored and it did some damage to my hair. I continued to use the products and I started realizing my hair was getting thinner and thinner at the top and front of my head. I ignored it thinking it was in my head because my shedding was less. Now three months into using the product, my hair loss is more noticeable than ever. I mean the hair in the front and top of my head looks like obvious hair loss. It is so thin. I am sick every day over it. I contacted the person who sold me the products and they say keep using them but I don't know what to do. When I noticed how thin (the thickest part) of my hair had become and the part that actually hid my hair loss when it was shedding over 200 hairs a day. That was what saved me. 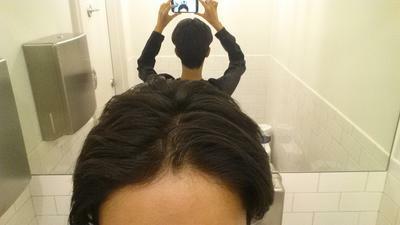 The front and top was always thicker than the back and sides. I am humiliated. I don't know if the products interacted with the hair color, or I have an allergy to them or what. 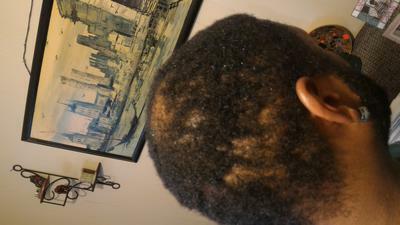 I can't see how for no reason you can clearly see my scalp all over in a matter of two months unless the products or something caused this. I feel like I have been scammed. And the damage it has done I can't live with nor can I see hope of it ever growing back now. I am devastated, in the last week I have stopped eating again. I throw up when I look at it and I am so anxious I can't handle being awake. I can't leave the house, I don't know who to trust now because I can't figure out what happened so quickly. I held off on using any Rogaine etc because it was not noticeable to other people, and I knew I had to try eating etc first. At this point I don't think it will ever grow back and I don't know what caused it. I wasn't stressed and I was eating. The only thing I did different was get it colored and use these products. 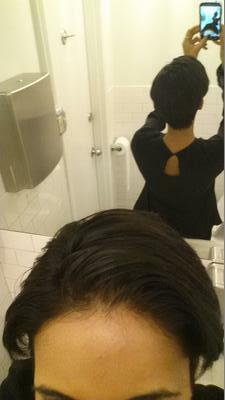 My hair is thinner (less hair) top of scalp showing than when I was shedding way more than this. But also each strand of hair is like baby hair. I am devastated that I have made this worse. I went from hair loss no one really noticed (I always did) to obvious thinning in areas that were not the biggest problem. It has never been this bad. During all the awful shedding never did it look like this. Now I am hopeless. Ready to just use Rogaine. I am panicked because I can't eat, sleep or stop the anxiety. I feel like an ugly man. I have a body image disorder and this is one of the biggest fears of a person like me. I see no way out. I was so grateful for the month and a half of improvement. I now am in a worse position than before I started to treat it. If I can't eat and can't stop this stress over it, I will lose even more hair. The stress and not eating started after I noticed it had gotten so bad. I am not able to function, can't even go to the doctors, or dermatologist. I am too humiliated. Do you have any insight on this. I trust you as you are really in this to help people. I can't see how I can live through this. It was hard enough when it was noticeable to me and I could hide it. Now it is worse than ever and I wish I could turn back the clock. What do you think caused this? I want to start the diet but eating itself I can't even do. I am hopeless. Thank you for reading and for all you do. I'm so sorry to hear about this. Of course your hair is going to grow back. Anything done can be undone. I need to know the name of the product you were using, and I'll take a look at it. Also, color can damage your hair. You can use henna and indigo or other plant color for your hair. Some people are super sensitive to chemicals like Rogaine, which has been known to cause shedding. So if this other product caused shedding, then Rogaine can cause shedding too. Here's a link to a story about Rogaine causing hair loss. Click this link to read story. I just need the names of the products you were using that caused the hair loss. Hang in there for me. Thank you so much for checking on this for me. You are an angel. The places were my hair loss is now are almost bald looking its so thin. also the hairs themselves are thinner than my hair was the texture. I don't think they can grow back. It is my part and the whole top and front of my head. My bangs are so thin and behind them. The rest is still thin as well, but the above mentioned were actually not my worst areas, the back was. I had thinning at the top that freaked me out but full bangs and the hair was much thicker, and I was the only one who noticed unless I told them or showed them. I didn't have additional shedding. That is what scares me. My shedding although still not normal lessened after I got my haircut and started eating and reduced as I used the products. This is why I don't understand what is happening. I did have the product on when I had my hair colored because I thought it was natural and the hair dresser used a different brand of volume for color. I have never had a problem with the brand of color ever. It's not permanent but the volume used was different and I believe too high. I am happy the shedding is less, but I notice I am losing the hair now from the area I mentioned. After I got my hair cut and started eating, my waves came back like the loose curls I used to have. After the coloring I did notice they dropped and it did not seem healthy like It was. I used the products for two weeks before the color with no problem, but started noticing the thinning over the period of the few months after. I ignored it at first. Now it is destroyed. I don't know what to think. The one product is called activance. water, ethonal, allanton, biotin, panthenol, sodium tactate, urea, stabalilzed sodium and potassium rhodanide, msm, amino acids, and vitamin b. no fragrance. the other product is called bio-fanelan regenerant premium. they are vials. There is a scalp cleanser as well but I can' find it at the moment it has no sls. They are known to stop shedding. Many people have had success on them. I just wonder if something in them doesn't agree with me, or if it was the color, or the mix of the two. I know that the kind of thinning I have now should not happen in a few months time. Especially since when I was shedding so much for over a year my hair was a lot thicker than this. I do have breakage as well, but I can't explain the thinning. And I don't know where to go from here, as they do help with shedding. I don't want to do the wrong thing. I can't calm down and have always been afraid of minoxidil, but the way it looks now I am terrified not to do something. Thank you for your help and kindness Sheree. I am sorry this is so long. I am so anxious and can't eat, sleep or function. I am so devastated. I also want to sign up for coaching. I know I need the support and have to start eating. I sent a request for that. The only other thing I can mention is in order to gain weight I wasn't following a certain eating plan but the weight gain helped me in all ways. I was eating whatever just to gain weight back. I have lost most of the weight in the last week due to this. I hope my eating didn't do this. I finally felt healthy again. It's hard to pinpoint exactly what this is. I know that certain combinations of chemicals can cause hair loss. It could be that since your hair is in a weakened state, the chemicals had some effect and caused hair loss. There's no way to tell for sure. You would be better off using pure henna or organic natural shampoo. One thing I've found out is that anything man-made can cause hair loss. This can occur whether it's a food or a topical product. Also, if you're underweight, this can interfere with your hormonal system. The right amount of fat on your body and in your diet is critical. Think of it this way: When women engage in extreme sports and lose too much body fat, it can stop their periods. Fat is a hormone regulator. And of course hair loss causes severe emotional trauma. Emotional trauma creates more hormonal issues that cause hair loss. It's a vicious cycle, but you can overcome this. I am going to work with you until we get through this. I'm not going anywhere. I have years of experience of not only handling the diet, but also the complete darkness that hair loss brings into your life. No matter how long it takes, and no matter what we have to do, we'll work on your hair recovery. I love cases like yours because it gives me something to dig my teeth into. I'll see you in coaching. Just promise me you'll never give up. Will The Hair Loss Diet Work for Severe Hair Loss? First of all, the website is awesome. It's great to come to especially when I need more information. I'd like to give a little information about me. Hopefully, I can get info and whatever other information possible. I have severe hair loss. I can even feel my scalp. I have went to 2 dermatologists and one gynecologist. I should say that I am back to square one. All my results came back normal. Well, let me say according to them. After turning 27, I started losing my hair. One of the dermatologists calls it androgenic alopecia. The other dermatologist calls it severe diffuse. I kinda think it's also severe diffuse. Well at this point, it is a size of nothing. Before, my hair was thick. I would break my hair pin. I have spoke to my physician, dermatologists, and gynecologist about hair loss due to diabetes, because it is unbalanced sugar where the blood does not provide the nutrients that it should. My sugar has been between 275 and 350. I believe the sugar building up in my body for 5 years may have caused the body to cause hair loss because it is not controlled. Comments for Will The Hair Loss Diet Work for Severe Hair Loss? None of the doctors believe that diabetes can cause this severe hair loss. What do you think? Thank you so much for visiting The Healthy Diet Paradise. You had some questions about whether the diet will work for severe cases of hair loss caused by diabetes. I'm not a physician, so I can only tell you what I've seen here. I do believe that diabetes causes hair loss. I've seen a large number of women with elevated blood sugar and uncontrolled diabetes with advanced hair loss. By the time these women have come to us, their hair loss is in the advanced stages. The whole premise of the hair loss diet is to control your blood sugar. So by the time diabetes has developed, hair loss is in the advanced stages. Your body is truly a walking miracle. You can reverse this process. It's a lot of hard work, however. control blood sugar causes plumbing problems. If you go on the hair loss diet, you need to check with your doctor to make sure that your sugar is well under control. This is for your safety. In advanced cases of hair loss, serious life threatening illness needs to be ruled out by a physician. In case after case, the hair loss has reversed no matter what the diagnosis is, with very rare exceptions. Once all serious causes are ruled out, I don't give the causes of hair loss a name. They are simply different manifestations of the same problems which are caused by diet. In order to give an estimate about hair recovery, I would need a detailed history of your diet. I would need to know a lot more about you. I can do this in coaching, as it can get very involved. The time estimates for regrowth can have vast differences. I usually get more of a sense of hair regrowth and recovery over a period of weeks and months of looking at a client's nutrition plan. You can start with our hair loss nutrition page. Click this link here. Please send us some pictures so we can keep track of your progress. Then I can combine your pages so we can track your results. Thank you so much for writing back, Sheree. I am so happy to hear from you. I need all the help possible. I know from all the reading that my hair loss has to have reached advances stages for diabetes, but I want my hair back. I do want to give you some information about me. I am Lacto Ovo Vegetarian. I do eat eggs and diary. I have had the worst diet for the past years. I have taken plenty of blood tests, and the only thing that comes up is high blood sugar levels. I am also overweight, especially for my height being 5'3". I have the body shape of apple where I am heavier on the top. I also have body fat in my stomach, which means stored sugar (I did some research...LOL) Help Sheree, Please! can walk with you step by step through the diet. I will push your boundaries, and teach you every concept under the sun. When I coach, I don't stop until I'm certain that my clients fully understand the diet. My teaching concepts are intuitive and are designed and tailored to fit each individual's needs. If you would like personal coaching, please use this link below, and we can begin. Which one should I sign up for? Which one should I sign up for? I am not good at asking questions. All I need is instruction for the diet, what should I eat if I am lacto ovo vegetarian (less dairy tho), how the diet works for me, and everything else I need to know. How long will you be there for me thru this process. Please let me know so I can Sign up. I need to get started with your help. Don't worry about the question and answer format. What I'll do is walk you through the diet for your personal situation. Since you are lacto ovo, there's a slight angle that you have to use with this diet. So the requirements are a little bit different. So there's no problem at all. I'll stay with you until you are crystal clear about how to proceed. So you'll only need one coaching session, and that will cover everything. So just use the standard form on the coaching page and we can get started. You are going to love it! 10 months ago I had thick healthy hair that never shed. I would maybe lose 5 or so hairs when shampooing. Last June and July I had such anxiety I stopped eating. Anxious day to night. I lost 20 pounds in this time. I then went on a medication that I had an allergic reaction to, got a rash and two days later my hair started pouring out of my head. It has not stopped and is now to the point I think it is very noticeable. It took awhile to affect the top of my head but now it is pretty bad there. I have been suicidal over this as I already have an existing severe anxiety disorder along with depression and a body image disorder. I will not leave the house and can't even care for my family. The dermatologist I saw has me on iron and Vitamin D. Also said to start Rogaine to stop the shedding and help with regrowth. I have not started as I am terrified of shedding worse (the box says 10% of people will shed first). I am anxious day to night, can't eat, don't sleep, and I know this is not helping. I need some hope. Comments for Will This Work For Me? It sounds like you have had some of the same problems I've had. I have had some of the same problems, and my hair has started to grow back. Its hard in the beginning, but after a while, you get used to it. Hi Karen thank you for your comment. Mine is still falling out rapidly and the top is really bad now. It didn't start affecting the top until the 8th month of falling out I guess. I notice not much new growth because it is still falling out. Did you have that problem? I am really terrified. Did you use anything else but the diet? Sorry for all the questions. Thank you for responding and for giving me hope. Yes, I had the same problem. Mine took a while to work. You won't always feel so bad. I had a hard time looking in the mirror in the beginning but its better. I tried different stuff, but the diet is what really worked for me. Thank you Karen, And I am so glad yours is growing back! I am so happy for you. I will try to work on the diet thanks again. Mary, I have used garlic on my scalp when I start to shed alot and it seems to stop it immediately. I just slice the garlic and gently rub on my scalp. Then wash it out in the morning. I found the remedy on another forum and it seems it is an old hair fall remedy. The diet will help grow the hair back!!!! I have been on the diet for only a couple of months and I see lots of new little hairs growing! Thank you I will try it. I am very desperate. I will work on my diet too. I have no appetite so I will really have to try to eat properly. Thank you for your help. I have no appetite from the anxiety of all of this. I am trying to eat. I have been having a shake in the am with blueberries, ginger root, and coconut milk. lunch spinach and tuna or chicken salad. snack nuts, oats and yogurt. Having trouble eating dinner. Any suggestions how to increase appetite and is what I am eating ok for this diet. I am going to add eggs (maybe for dinner and another salad with spinach. Also has anyone tried the hypnosis for anxiety offered as a download? Thanks for any information and help. I hope everyone is doing well and seeing great results. I have tried the hypnosis and try to use it daily. I would say for you to get it for sure, since you are having so much anxiety. I was in the same boat as you and i got a low dose of anxiety meds from my doc. which helped take the extreme misery out of every day. Now I feel more hopeful and the hypnosis helps. Thank you Michelle, I have been thinking of trying it as I can't get this anxiety under control. Already on a medication as well. Thanks for letting me know it was helpful for you! Your Hair Will Grow Back! Thank you so much for these photos. 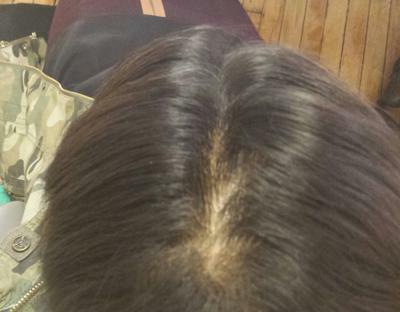 These pictures will show your hair regrowth progress, and will help to motivate you even more! I am completely confident that the section of hair loss in the middle will fill in quickly. Just wait and see. You're going to do great! So I wanted to give you a breakdown of what i've been eating the last 2 weeks. Do let me know your thoughts and where I can improve. Breakfast is usually eggs scrambled with sardines. I eat sardines every day. A coffee with almond milk and a green tea. mid morning snack is a fresh green juice, sweetened with the freshly squeezed juice. All ingredients are vegetables, that's the only fruit. Then gluten free oats with almond milk. Lunch is usually chipotle chicken salad, guacamole, beans, cheese, spicy salasa. Or spicy crunchy tuna sushi rolls with brown rice. Mid afternoon snack is a banana. Dinner is usually broccoli, sweet potato mash with butter. or a small snack of plantain chips from wholefoods, or Kirkland roasted seaweed paper. I try to add beans into my diet as much as possible. Now that its pomegrante season I have those every other day too. Yes, you are definitely on the right track. Your food choices look really good. Your breakfast needs to be more rounded out, however. If you're eating just eggs and sardines for breakfast, that's pure protein, and this alone can create an imbalance. Also, you're only eating broccoli and sweet potato mash with butter for dinner. This is also unbalanced. There are very specific food types that need to be eaten together. So in other words, the food you're eating are perfectly good, but the combinations are off the diet. Blending your food is critical. Here's the link to our 7-day menu so you can see exactly how your food should look. I will wait for your update! I can see how it's imbalanced. What do you think if I add black beans to my breakfast? And add chicken to my dinner to go with the broccoli? Also plantains chips? Are they a high Gi food? This diet can get tricky. One of the biggest mistakes that I uncover in coaching is food combining. I would avoid the plantain chips. I'm unsure of the GI, but they sound like they could be a problem. And of course black beans are fabulous. Eat black beans as often as you can. And adding the chicken to your meals will give you a solid base for your diet. Eat a lot of food. That's the real secret. When you eat whole foods, you could literally eat all day and not gain a pound. Wanted to check in with you. I hope yoy had a lovely thanksgiving break. I have been following the diet as close as possible, sometimes I find it hard to eat enough. I will confess I've had a few nights of Vodka, soda, lime drinking, maybe 3 mishaps. Has this jeopardized my progress? I feel so much better, skin is heaps better. No improvement on the hair loss though. I had a great Thanksgiving break. I hope yours was good too! You said you've had a few cheats. If you've only had three mishaps, then you should still be okay. And if your skin is doing better, the hair will soon follow. The skin is extremely sensitive, even more sensitive than the hair. So give it a few more weeks, even a few more months to see new hair. Thank you for providing us with this platform, I find this site so valuable for nutrition support and advice. It is truly wonderful to come here and see so many people working on their health and getting their hair back! I was diagnosed with hypothyroid and hashimotos disease in 2009. Since then I have slowly been losing my hair ( pics to come) My hair is like baby hair, thin and fly away. I wear it short to disguise the thinning. As well as thyroid deficiency (which is control with hormone replacement therapy) I also have PCOS. Awful acne and barely there periods. To control the PCOS I have been on Yasmin (anti androgen birth control) since 2007. I started the diet 2 weeks ago, so far so good. Still have some questions. Will the birth control pills hinder my progress? Also carbonated water (club soda), if I have this once a week is that really bad? I've been checking gluten free products in the grocery store and found a pasta which is made from corn and quinoa and found Bobs Red Mill gluten free pizza mix, what are your thoughts on these if eaten once every 2 weeks? I also use Guldens spicy brown mustard and hellmans light mayonnaise in chicken salad. I am determined to commit to this, I want results! Thank you so much for visiting, and for your submission. You're committed, and I can clearly see that you have a very positive mental attitude, which is essential for this lifestyle. Thyroid disease is closely associated with hair loss and can be reversed. Hair loss is also closely associated with PCOS. The birth control pills can also cause hair loss. I've had a few clients who were taking specific types of birth control, and went on the hair loss diet. And the diet had zero effect on their hair growth. Their hair continued to thin and fall out. It's extremely rare that the hair loss diet does not work, but birth control is a hormone that changes the chemistry in your body. The effects of each birth control pill is unknown, and the only way to tell for sure is to proceed with the diet, and then wait a few months to see if the diet will work. Plain club soda will have no negative effects on the hair loss diet. It needs to be free of sugar and other additives. I would completely avoid the Bob's Red Mill pizza mix, because it will raise your blood sugar. We want to keep the foods as close to 100% natural as possible. That is the goal every day. The Gulden's spicy mustard is fine, as long as there's no HFCS or other sugars added. In general, most condiments are great and will not cause a problem at all. 90 percent of the gluten-free products on the market do not pass the hair loss diet guidelines. Even if we introduce something new, it has to go through a test and watch phase, and that can take months. So we're really very careful. Any processed gluten-free foods have to be double checked. The corn and quinoa pasta you're talking about is really good. You can eat this at least twice per week without any problems. The Hellman's light mayonnaise most like has sugar added. You can check the label to make sure. I'm looking forward to your pictures, your update, and your success story. Thanks for your input Sheree. I really appreciate it. I hope this diet still works for me even though im on Yasmin BC. I checked the mayo and it does have sugar, however it does not state how much. I will skip it. Great news about the gluten free pasta. So delicious. Is coffee ok? I have mine with almond milk. Also fat free greek yogurt with berries? I tried to upload my pics and dont see where i can do this. For the pictures, you have to create a completely new submission, and then it will give you the option to add pictures. Once you already make your submission, it takes that option off. So just go back in, and then do a completely new submission, just like you did the very first time. I'll look out for your photos. I'm looking forward to it! My Hair Will Not Thicken Up! Hi Sheree, I have been losing my hair for the past five years and now my scalp is beginning to show. The derm said my ferritin was low at first, but since November, it has been within the appropriate range. I have been on the healthy hair diet for a whole year but my thinning is getting much worse. I must be doing something wrong. I eat the same three meals throughout the week. A chicken bowl with brown rice (chipotle), a kale salad with grilled chicken, and salmon with spinach and brown rice (Cheesecake Factory). I take borage oil, he shou wu, biotin, elemental iron, saw palmetto, and ashwaganda every day. I am a female in my 30s. My mom is losing her hair too but it didn't start until a few years after menopause. This is too early for me to go bald! Please help! I'm so depressed. Comments for My Hair Will Not Thicken Up! I've seen people reverse hair loss after 25 years of struggling. There's a fire of determination in them that just won't let them quit. And I've said this many times before, genetics is only part of the equation. You're only in your 30s, and your chances of hair recovery are excellent. The food you're eating sounds really good. After a year, you should be seeing some growth. If you're not seeing growth, there could be several interfering factors that are causing delay. Once these factors are cleared up, then you wait six months to a year again and wait for progress. There are many factors that can interfere with this diet. Even our emotional state can create hormones that literally cause the hair to fall out. I would have to know a lot more about you to make an assessment. It's very hard to tell what is interfering with your progress. Keep going forward and never quit. If you need help, sign up for coaching, and we'll get to the bottom of what could be causing this delay. Does your diet work for older women? My edges and top of forehead are gone. What to do. I'm tired of wearing wigs and hats all the time. Please help. Yes, the diet works for older women. My oldest client was in her 70s and her hair grew back. Go ahead and begin with the diet, and of course we're here if you need us. Hello. My hair has thinned to a great degree in the last 2 years. After watching your video, I cut sugar completely from my diet...again. That was about 3 weeks ago. I am diabetic and should stay away from sugar anyway but somehow I was really on a serious binge for awhile. I also stopped eating honey and I have switched to a low glycemic agave instead. I also use stevia with no additives. Is that good? I have already cut my insulin requirement in half. I wrote you on your YouTube blog but didn't get an answer. I think perhaps I may have made an error of some kind. I have purchased the Biotin and the folic acid and I will purchase the Skin, Nail & Hair vitamins tomorrow. I am taking very good care of my hair and I want any suggestions and guidance you can offer me. Diet I know is the most important thing. You should know that I don't eat red meat or pork. Rarely chicken, but I do eat fish a couple times a week. Should I have more protein in my diet? It's too early to tell about my hair yet but I am optimistic. Your hair is fabulous! You just look healthy & great! My nails reflect the condition of my hair as well. Thin & soft with ridges. I don't know what that means!One more question. I plan on going on the 10 day Master cleanse this month. I'm hoping it will help detox my system and alleviate my allergies. Any suggestions would be welcomed. Thanks so much for your help. when ur in the hair loss diet page u click on low glycemic recipes and the hair loss nutrition guide...) They give the actual menu for the diet. All of the links on the hair loss diet page lead to more information about the diet. It took me a month before I understood where to start.:D. But i do believe i'm getting the hang of this. Thanks so much for the help on finding the Low Glycemic diet. Now I feel like I can move forward with this incredible new lifestyle. I just really needed to see some recipes! There's so much good information Vitex and Borage oil without any luck. I haven't tried Walmart or Walgreens yet so hopefully I'll find it there. As I've said before, I have stopped sugar. That's huge for me! Now I need to check out the Glycemic index and keep it close at all times. I'm very excited about all of this and I look forward to sharing my progress with everyone. I'll let you know how these recipes turn out. I am moving through the process of fine tuning my diet. I am going to make the low glycemic Oatmeal cookies from the recipe I found on your site and I am concerned that one of the ingredients is Xylitol. I read some disturbing info on Naturalnews.com about this sweetner. Please tell me what your thoughts are on this. Do you think it's okay if I exchange the xylitol with Agave? Will it still be low glycemic? I want to do this right! My name is Karen and I was wondering if there were any West Indians following this hair loss diet on here. I just bought the e-book and I haven't seen any mention of plantains or cooking oils. Does anyone know if plantains are a safe alternative to sweet potatoes or yams? It's been a staple my whole life and it helps me feel full. Also there are no mention of olive oil, canola oil or any other type of cooking oil in this book. Is it ok to cook with those? What about salt and pepper? This diet is going to be quite a challenge but I'm grateful to have found this web site. We've had many West Indians on the hair loss diet, and they've been successful. Plantains are fine for the diet. It's processed foods that we're looking at that are pre-packaged that you have to look at very closely. The Hair Loss Diet Quick-List ebook explains exactly which oils to use, and which ones to avoid. We don't use canola oil. The hair loss diet is a spiritual quest for those who attempt it. And for those who finish, the rewards are unimaginable. I wish you a safe journey and a safe passage through the challenges you will face, and I wish you all the best. Are salt and pepper ok? Thank you for the quick response, Sheree! Yes, salt and pepper are fine. Most spices are fine, even though many of them contain tiny amounts of sugar. The biggest thing we look out for is wheat. Look at the label and make sure there are no wheat products, and you'll be fine. I too, am West Indian and I'm happy to hear that I can eat plantains. I didn't think about this earlier but last week my sister made them and offered it to me. I was a bit concerned about it but ate it anyway. I've been seasoning my food the way we West Indians do but have tried to cut down on the salt. I'm eating curry goat, lamb and some chicken here and there but mainly fish. Sadly I can't have the roti skins because of the wheat content. West indian recipes and bread? Do you have any recipes that are in line with the diet but are nutritious? Any tips you can recommend? Also, I noticed that certain things like rice flour bread and garbanzo flour bread (couldn't find the latter) are permitted. Can someone tell me what's going on with my hair .... about 10 years ago my edges or side whatever you wanna call it about 10 years ago my sides fall out within four months of me growing my hair out. And it happens every time I try to grow my hair out longer than 3 to 4 months, my hair would just fall out. It's not like it's going bald on the edges. It grows. Then last year I got a crown issue. I have no receding hairline. The top of my hair is fine, but everywhere else I'm seeing problems.... is this fixable? I used to have the thickest hair. Ironically, I was never happy with it, I always wanted straight hair. Ha. My hair still has nice curls, but I've lost at least half of it...If not more, over the last 10 or so years. I suppose it was mostly gradual thinning, but about 3 years ago I started to really notice a widening part and my frontal scalp under bright light. About 2 years ago I was finally able to go to a doctor and learned I had low vitamin d, iron (was quite anemic), B levels and was in the early risk zone for hypothyroid. As of October, my ferritin was 19, it had gone up. I've been off and on supplements, as waves of depression come and go. I just get discouraged easily and supplements are expensive. This winter I experienced a great level of hopelessness, despair, depression about my life in general, and of course my hair. I began a Rogain regimen, stopped after about a week... I began this because I finally went to a dermatologist and was told I had androgenetic alopecia!!! The derm spent maybe 5, 10 minutes before she diagnosed me. Is that craziness or what? I stopped taking my supplements for a couple months, then began again in March or April, on and off. Just this past month- May I began the Rogain regimen again. I also have been regularly taking my iron and B supplements. I maintained Rogaine application for almost the entire month. I did not notice any changes in my hair. I did however, notice a slight increase in water retention in my face. So I decided to end that. In 2013? I lost maybe 30 lbs (from 160/170- 140). I was eating 700-1000 calories per day). Not healthy, at all. I'm sure this contributed to my vitamin deficiencies). I am currently 165-170 and really want to lose weight. I have been exercising the past couple weeks which I'm very pleased with. I just really want my hair to grow back. I do feel hopeful, I just need to maintain the hope. 23 is very young for a female to have AGA thinning, but I sometimes think back to what the dermatologist told me. The diet I feel good about. I'm really hopeful this will work. Hi, Sheree. How long does it take for your hair to recover after a few accidental gluten exposures? I was following a gluten free restaurant guide and had a tostada that was identified as gluten free on a few occasions in the last several months, but I just now discovered it's wheat based. Also, does the amount of gluten matter? While I understand it's best to avoid all gluten, but what happens if yiou're exposed to traces of gluten? You have to be super careful in restaurants, because a lot of people don't know what gluten is. What you can do is remove the tostada shell and just eat the inside. On the hair loss diet, we don't eat corn of any type because it's a genetically engineered food. You asked how long it takes to recover after gluten exposure. It depends. If you have some type of autoimmune disorder, any type of gluten exposure is very serious. I can take six months to three years to heal after gluten exposure in sensitive people. If you do not have any type of autoimmune disorder, like lupus, Hashimoto's thyroiditis, or Celiac disease, then occasional gluten exposures will not cause hair loss. For people with autoimmune disorders, traces of gluten can be disastrous. The amount of gluten does matter. The higher the gluten content, the more damage occurs. There's a lot of information about how and why gluten damages the gut, hair, organs and immune system, but it would take several days to explain it. For hair growth, it's extremely important to avoid it. But tiny trace amounts of gluten won't hurt healthy people. People who are healthy with no issues can have very occasional gluten exposures without causing hair loss. My estimate is no more than four to six times per year. So approximately every other month would be fine. Anything more than that, and you could run into problems. I hope that answers your questions. And good luck to you! Thank you, Sheree. So no more tacos with corn tortillas? I remember reading somewhere on the site that if we load up the tacos with healthy fats, it'll lower the overall glycemic index. Just want to make sure corn tortilla is now off limits. Does this also apply to fresh, frozen, and frozen corn? It's true that if you load up a taco with healthy fats, meats and vegetables, it will lower the GI. With corn, we are concerned with the GI, and with the way the corn is produced. We eliminate all corn and all byproducts of corn. Corn is not only high glycemic, but it's a genetically engineered food that we avoid in all of its forms. Corn is genetically engineered to produce its own pesticide, and this is toxic. Not all corn is GMO, but there's no way to screen it unless you buy organic. So just to be on the safe side, we remove it. Frozen corn, canned corn, corn oil, or any products made from corn should be avoided. Hi I was just wondering if organic popcorn you pop in an air popper would be ok for a snack with real organic butter, and sea salt??? I know you said no corn, but was just wondering if organic popcorn would be ok once in a while without loosing our hair??? Thank you. Organic pop corn is a wonderful cheat snack. Just make sure you eat it after a full meal to blunt any possible blood sugar hikes.